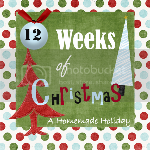 Jenny Matlock: 12 Weeks of Christmas - All about the food! Thank you! The pictures of your grand-kids delivering are very inspiring. It's so nice to be neighborly. That recipe sounds good, plus you can't go wrong with cheez its! 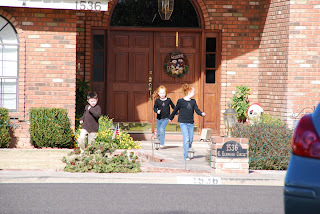 Love the pictures of the grandkids delivering goodies to the neighbors! Dearest cousin .... I LOVE these, but I do them with Snyder Nuggets (pretzels) and the kids can't wait to get their hands on them .. I mean they take them off the hot baking dish ... oh and sometimes I add oyster crackers .. try it, you might like it! lol Thanks for the recipe! Hi Jenny...it is so nice to meet you! Sorry it took me so long to visit you. 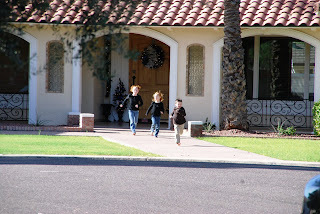 Love the photos of your grands running ftom the house...what a great idea to gift your neighbors like that! LOVE these pictures. How cute and what a great idea! I think I am going to have to try these. Jenny, I prefer savory versus sweet when given the choice, and these sound so GOOD! Thank you for the recipe. It's a definite keeper! Loved your story about the man who came begging at your door. LOL! thanks for the heads up on freezing the chex mix. I did not know that, but boy will this come in handy! Jenny, we love these! Zac has a huge project to do this year (his senior year!) and for part of it he chose to learn how to cook. Guess what his first recipe was?! I usually make these with Cheez-its, but the last couple times used Goldfish crackers. (the cheese ones) The recipe I have (I thought it was Terri's) calls for the fish crackers. yum yum yum yum! Love me some Cheese ITs and all that seasoning can only make them better. THank you for the recipe!! love the divorced guy trying to get your crackers in the divorce :D they must be super duper good!!! Wow...that sounds so good! And a nice break from the usual sweets that get handed out!